Single digits. We are just a handful of days away from a real “Play Ball!” Less than a week and a half before Matt Carpenter takes the first pitch (and probably the second) from Jon Lester and gets the 2015 season underway. You can just about taste it, can’t you? I figure most people would think I’d be going with Slaughter here. After all, Slaughter is the one that has his number retired out there on the wall, albeit well after his playing career was over. (It’s interesting to note that though he went in to the Hall of Fame in 1985, his number wasn’t retired by the Cards until 1996 when the new ownership group came in. I guess the Brewery didn’t have the same philosophy when it came to taking numbers out of circulation.) Slaughter’s famous for his mad dash, of course, and is one of the legends of Cardinal history, though perhaps (at least in my mind) on a lower tier than Lou Brock, Bob Gibson, Stan Musial and the like. I really was going to go with Slaughter but a quick search didn’t turn up any pictures of him where you could see his number, save the famous “1946” one that Whitey Kurowski, Slaughter, Marty Marion and Musial posed for. I’m sure there are some, but I was kinda leaning a different direction anyway, so this just confirmed that maybe I should pick a different face for today’s countdown. While there are a number to choose from, including a discussion about how Pendleton was one of the few to leave St. Louis after a lengthy stay and have more success elsewhere, I think Torre makes a good selection because, if nothing else, it helps us realize just how we should rate managers. We think about them making these significant impacts on a game, and sometimes I guess they do, but when it all comes down, it’s the players that win or lose ballgames. How else do you explain the fact that Joe Torre went into Cooperstown last year? 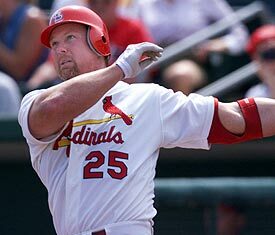 After he left St. Louis in 1995, he had managed 15 years and had a plus-.500 record in five of them, three in St. Louis. He’d never won a postseason game. He was nobody’s choice for a genius in the dugout, overshadowed by Bobby Cox, Tony La Russa, even folks like Sparky Anderson. 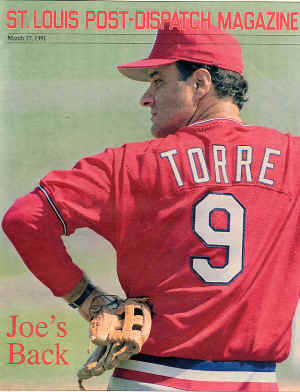 If you were listing the top managers in the game in 1995, Torre wouldn’t have likely be in the top 10. Then he went to New York. Given a team that was loaded up with talent and a team that would react well to his laid-back demeanor, Torre became that legend that we know today. He won four World Series and went to two more. And, as I say, he punched his ticket to the Hall of Fame. Now, am I denigrating what Torre did in New York? Not at all. While we like to think it probably was a “push-button” job, there were plenty of things to have to decide, plenty of hurdles to overcome. Even if the on-the-field stuff was easier with folks like Derek Jeter and Roger Clemens, there was still the New York press, George Steinbrenner, and all the other things that can make being in charge of the biggest franchise in baseball such a minefield. Managers are the best when they plug into a place that works for their style. I think that’s what we are seeing with Mike Matheny as well. St. Louis can win on its talent, no matter what mistakes Matheny might make as he learns the job. It needs a guiding, but not overbearing, hand in the clubhouse, a manager who can deal with the people and get them ready to succeed. Hopefully Matheny will continue to grow and learn and maybe someday we’ll think of him like we think of Torre, someone that found where they needed to be and thrived.